Hello everybody! 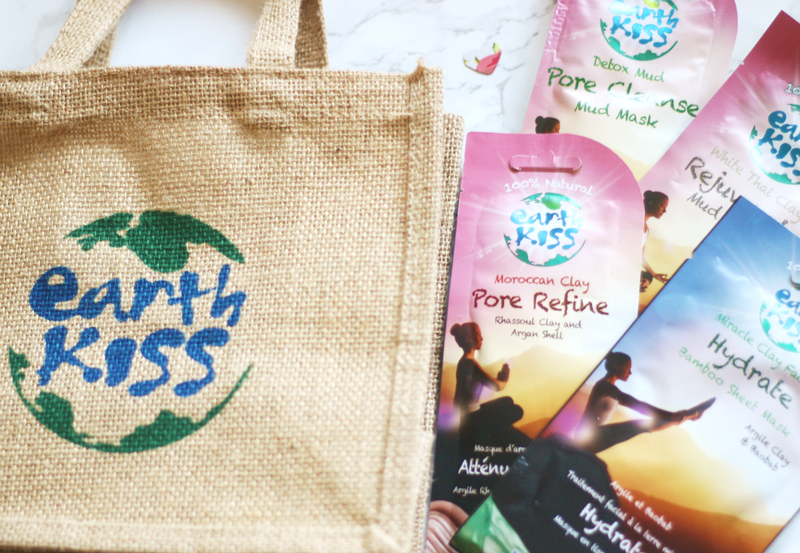 Todays post is an introduction to an exciting new brand called ‘Earth Kiss’. Their story is based around the impact that intensive farming methods are having on our planet. (You can read more about that right here). The key ingredient in all of their masks is the himalayan Shilajit which is energised with 85 plant micronutrients, which sounds amazing! Again you can read more about that in the last link if you’re interested. 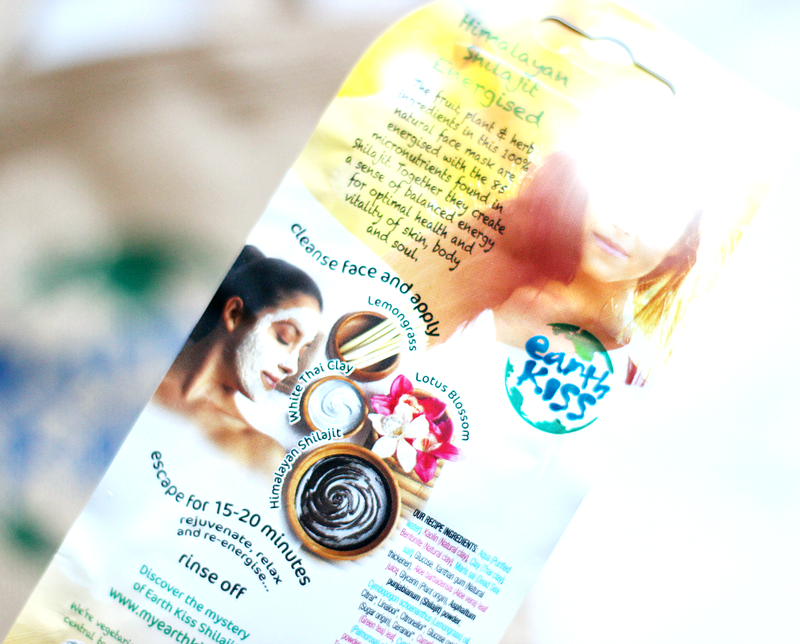 This mask (and all the clay masks) has enough in the packet for between 2-3 applications which is great for a family face mask session, or you could simply snip the corner, take what you need and snip more off the next time! Anyway, this was the first clay mask out of the whole bunch that I used and on this particular day I was feeling pretty blah and in need of some TLC. My skin was not looking so good and I was in the mood to sleep all day because I had had such a busy week. The clay on my skin felt super cooling and the colour is completely white when dried. It also dries very quickly and it kind of crumbles a little too. I left it on my skin for twenty minutes and as soon as I washed it off I noticed a difference straight away! My skin was brighter, cleaner (obviously) and literally glowing. Like I said I was having a really crummy day, but seeing such a difference in my skin was very uplifting and kind of pulled me out of my slump. Its the little things right! 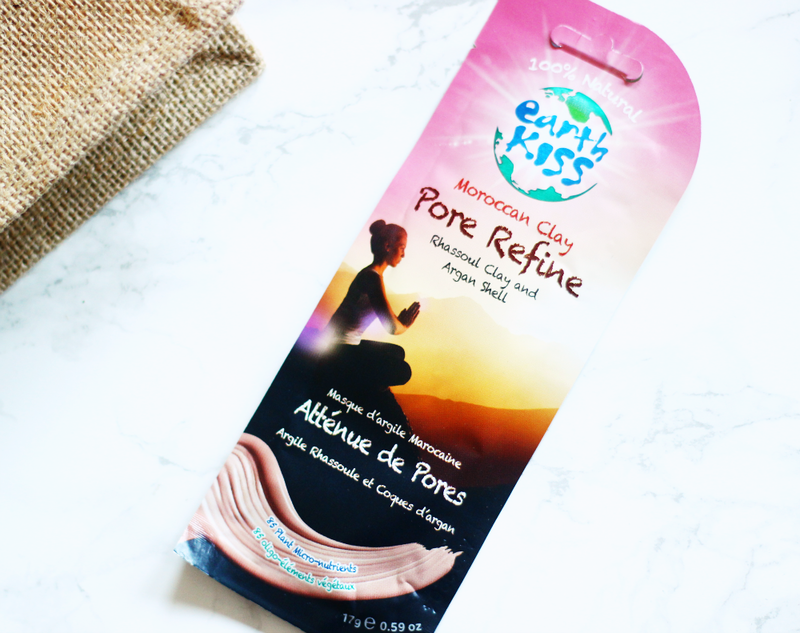 It is aimed at combo, normal and oily skin which I would agree with, any excess oil on my face was gone but my skin also felt pretty plump and not dehydrated at all. Repurchase? Yes, I haven’t experienced many masks that leave my skin feeling so ‘rejuvenated’ (literally living up to its name) after one use! So this mask was pretty exciting for me because I have heard of sheet masks for a while but I’ve not gotten around to trying any before this. Now according to youtube sheet masks are pretty thin, so I expected this one to be thin too. However as you can see from the weight of this mask it was pretty thick/heavy on the face! I think the reason for this is because it is natural bamboo sheet mask WITH organ clay and the clay itself most likely makes it heavier. 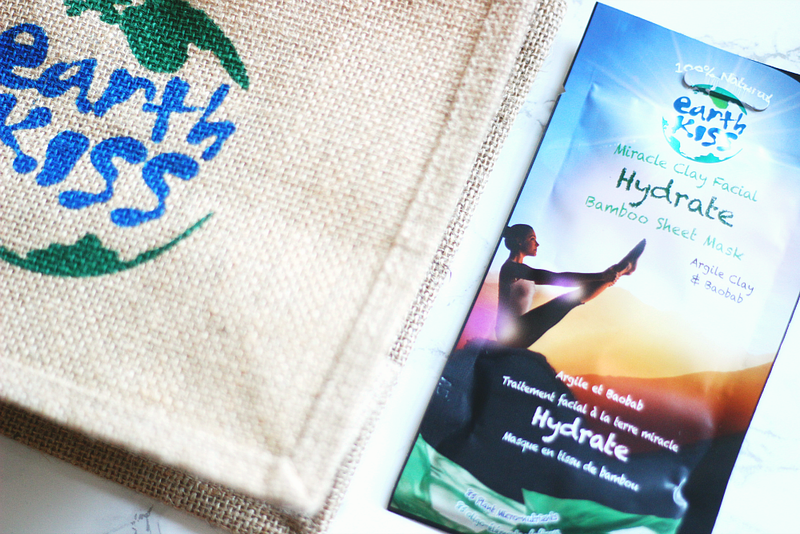 The clay and the baobab work together to cleanse and nourish the skin. Now my experience with this mask unfortunately didn’t go quite as well as I would have liked, although I’m not entirely sure how much of that has to do with my mask. The day that I used this mask my eyes were already pretty sore and sensitive as I may have been crying a little bit (again we’ll address that in my January update soon, it’s been quite a month!). My skin again was feeling pretty bad and I thought this sheet mask would be a good pick me up. However when I put it on my skin, my eyes started watering a lot and they felt more sensitive than usual, to the point where I had to take it off after 5 minutes! I can’t say that my skin looked much different after such a small amount of time and unfortunately my first experience of a sheet mask wasn’t quite what I thought! Repurchase? No, I can’t be sure if it was my sore eyes or the mask that made them react that way, but I won’t be repurchasing this particular one. 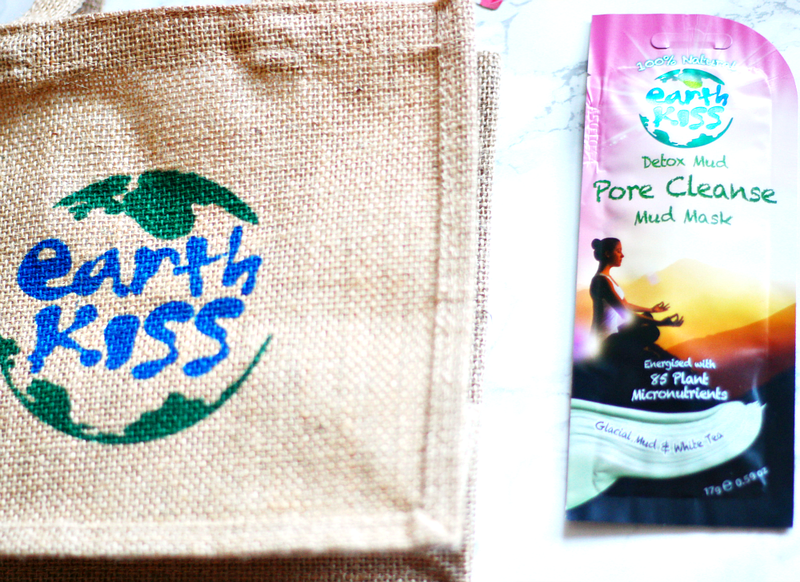 The pore cleanse mask was an absolute pleasure to use, it is made from glacial mud and it was the most cooling from the four that I tried. Cooling and refreshing are two words that came to mind straight away, as the mask dried I felt the most pleasant cold sensation. I totally understand why this mask is labelled as ‘detoxing and destressing’ and it amazed me how quickly and effortlessly this mask too me to a more zen place. All I needed were two cucumber slices and a towel turban wrap and I would be a real life cartoon spa-aholic stereotype. The cooling properties in this mask are probably also attributed to the fact that it has spearmint in it and I wrote in my blogging notebook ‘this one feels incredibly cooling and like it is actually doing something!’ Once I had washed it away with warm water, my skin felt wonderfully refreshed and like it had been truly cleansed, right down the smallest pore. 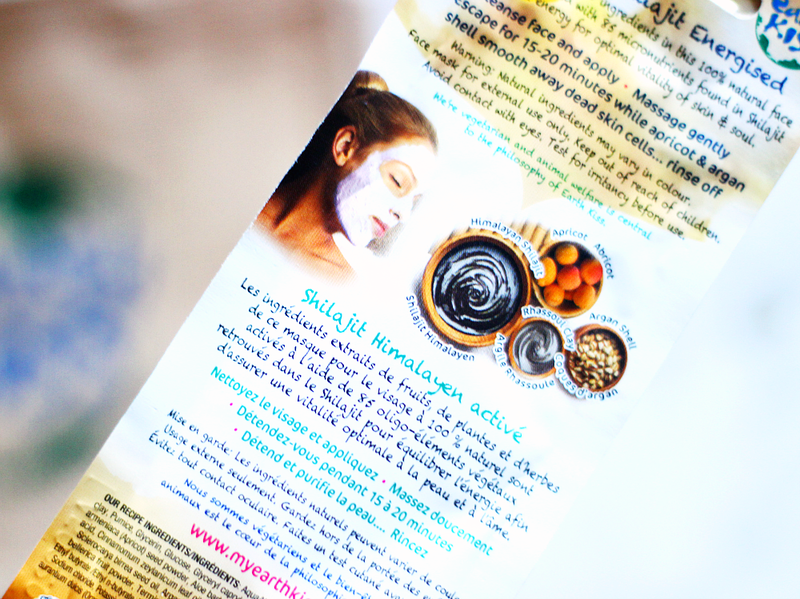 Again like the rejuvenating mask, this clay mask really lived up to its name and I could easily see it being added to my weekly skincare routine, especially these days as I am going through a fair bit of final year stress! Repurchase? YES! 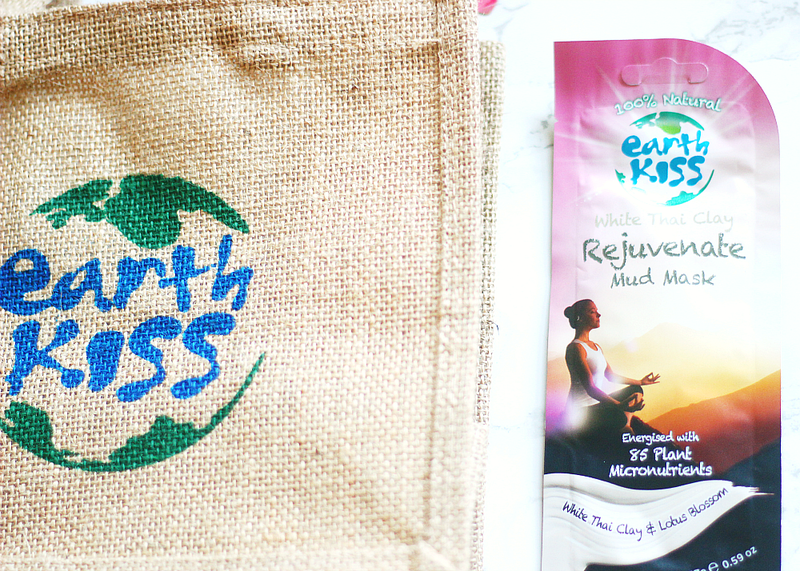 I still have two uses out of this packet, but I am definitely stocking up on this mask, its the perfect detoxing mask and I’ve never tried anything quite like it. I wondered what would be the main difference between this and the pore cleanse mask and I found out as soon as I started applying it to my skin. It has the smallest gritty bits in it which are made out of crushed Apricot seed and Argan shell! How cool is that? I absolutely love how these masks are 100% natural and the idea of an exfoliating mask is so revolutionary to me. The clay in this mask is called Rhassoul and it is found in the Moroccan Atlas Mountains, which are naturally enriched over a million years with mineral goodstuff. I love the colour of this mask too, its a brown shade and dries down to a lighter colour, I know how you look in a mask isn’t really relevant but I deemed this mask to be very IG selfie worthy (if you were up to taking one of those that day). ANYWAYS back to the mask review, I left it on my skin for 20 minutes and then went to wash it wth warm water. The lovely thing about this mask having the tiny tiny apricot shell bits is that as I washed the mask away in circular motions I also gently buffed away dead skin cells and any drier patches. My nose area at the moment is behaving very bizarrely, it does produce oil throughout the day but in the last week or two the tip has also been dry meaning any makeup has looked highly unflattering because its been bunching up there and flaking off (ewww!). This mask, though gentle enough for the whole face was also effective enough to help me deal with that dry skin and it really didn’t feel stripping at all. Repurchase? Again because I have never used a mask that is exfoliating before and more to the point such an effective yet gentle physical exfoliator I will definitely be stocking up on this soon. 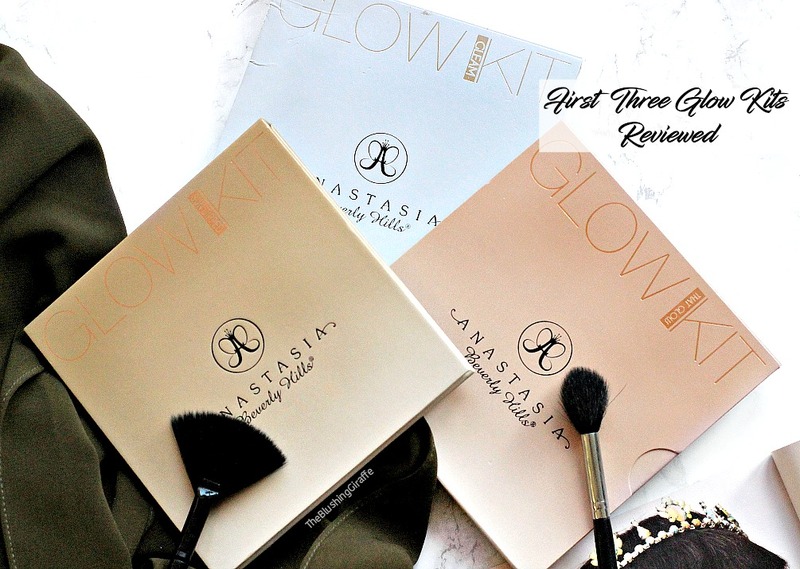 All in all I have had a fantastic experience with this brand, mainly with the clay masks. I feel like they have been named accurately and you get what is written on the packet. You can tell that a LOT of effort has gone into thinking about each mask and the ingredients which have gone into it. They are so effective and the results on my skin are almost instant which honestly doesn’t happen often when I use face masks. 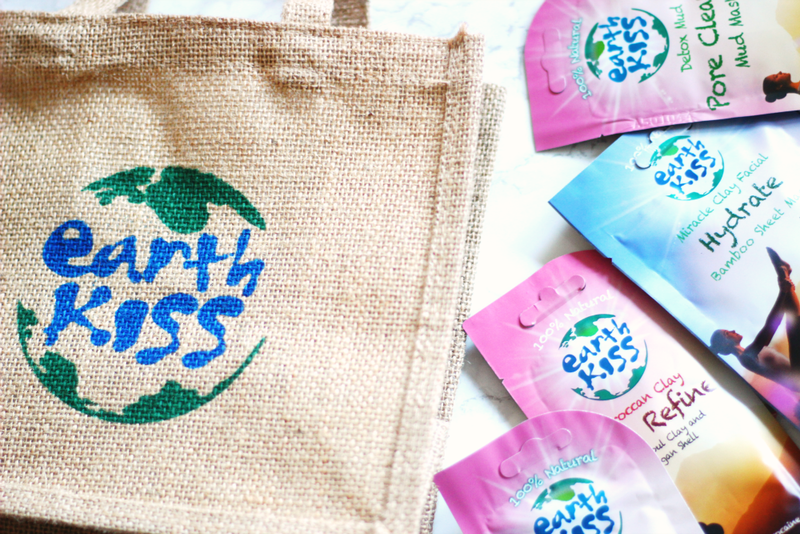 The purity of the ingredients speak for themselves and again the uniqueness that each and every product in the Earth Kiss line is 100% natural is so brilliant! I think the price point of £1.99 is such good value, especially as one packet holds at least 2-3 uses. 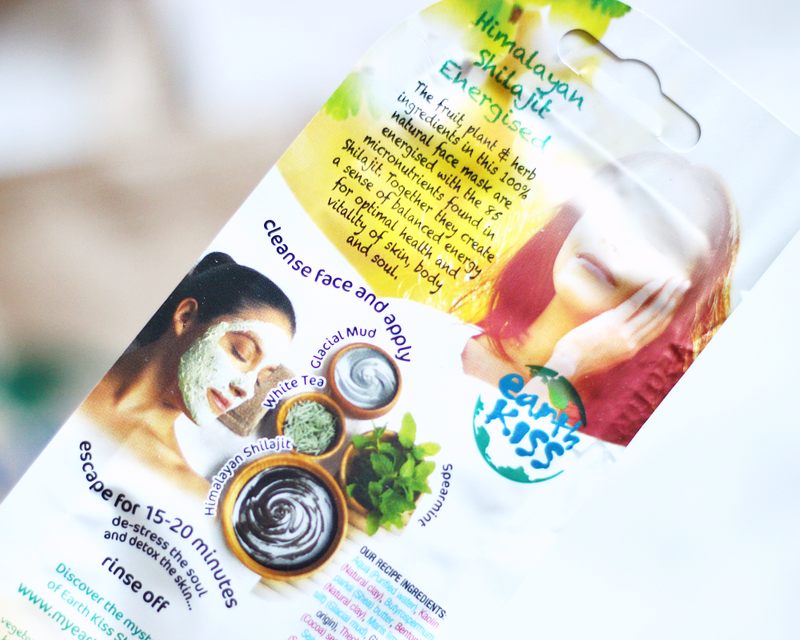 Will you be checking out the Earth Kiss face masks? *This post contains press samples or products gifted to me. All opinions are my own. For more info check my Disclaimer.